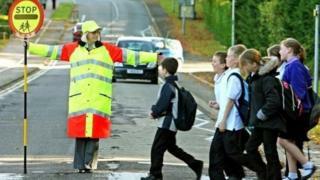 The final eight lollipop crossing patrols on Anglesey are being scrapped in the summer in a bid to cut council spending. Patrols on the island have been gradually reduced over the past eight years and the council said remaining schools did not meet criteria. The patrols will cease at the end of the summer term in July, saving the local authority £58,000 a year. Anglesey council said the services were "not mandatory". It assesses whether an area needs a crossing patrol based on the number of pedestrians and the amount of traffic at a site. It added no schools met the need for a crossing, with the exception of Ysgol Kingsland in Holyhead, where it is "investigating the possibility of a zebra crossing". Glyn Hayes, councillor for Holyhead ward, said: "It's a last resort when you cut a service like that, one which primarily safeguards the lives of youngsters. "It's not a large amount of money - a drop in the ocean, really - but I understand the pressure on the authority because it has to protect frontline services. "Risk assessments are based on hypotheses and can't mitigate against any incident that might occur. Children and roads don't mix, do they? It's a very dicey thing to do. It's a sign of the times we live in."